As you turn into the Yorkshire Sculpture Park there is a spot on the left hand side, on a little rise at the top of the long hill which sweeps up from the lake, which can be seen from all over the park. 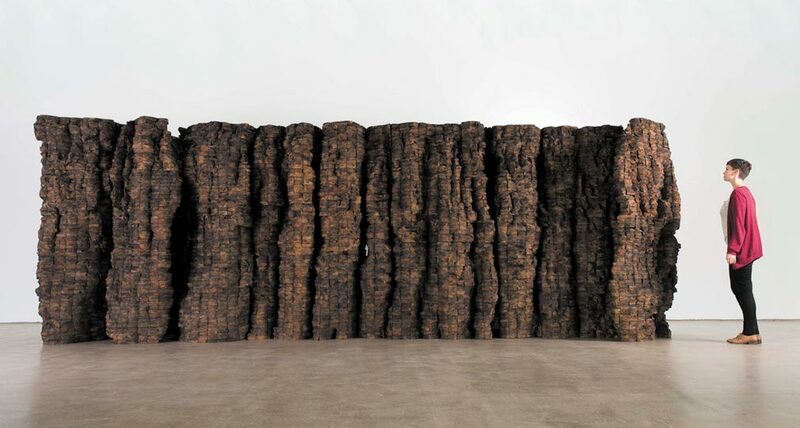 It is here that Ursula von Rydingsvard, a sculptor highly regarded in America but hardly known in Britain, has chosen to place her newest work. A spectacular six metre high bronze sculpture spiralling outwards from a narrow foot, the triumph of Bronze Bowl with Lace is its crown of bronze filigree flaring from the top. On press day, I saw this in broad daylight. Heavily patinated by the artist in shades of brown, orange, blue, copper and silver, in one light it dominates the landscape. But – in a manner that is true of much of von Rydingsvard’s monumental work – from another angle, and in softer afternoon light, the piece almost disappears into the background of trees and grass. In the evening, lights both within and around the work lend it an otherworldly presence. The combination of grandeur and discretion and the gesture towards domestic craftsmanship on quite another scale (in this case lace), is key to the powerful, unsettling appeal of von Rydingsvard’s work. This is, remarkably, the artist’s first significant solo show in Europe, and the largest exhibition to unite both her indoor and outdoor work – it features over 40 works and drawings from the 1980s until the present. Von Rydingsvard was born in 1942 in Germany, the fifth of seven children to her Polish mother and Ukrainian father, who had been forced to abandon their home in Poland. She grew up in camps for displaced persons until, in 1950, her family was able to migrate to the USA. To this day her work reflects the intensity of her experiences in those early years. The lace that has inspired the crown of her Bronze Bowl harks back to the pieces of prized Polish lace the refugees kept with them, a mark of their national identity. The giant wooden plates and shovels in the Underground Gallery suggest the enormous emotional resonance these simple objects have for her. Standing inside the sculpture, you feel the embrace of the piece but also admire the intimate detail of von Rydingsvard’s method – every centimetre of wood has been worked. The artist often rubs graphite into the finished wooden sculptures to burnish them, and tone down their brightness. For this piece, some vertical strips of the front have been left untreated to show the contrast between the vigorous raw wood and the softer, poetic, variably grey-ish parts. It is a reminder too that the appearance of naturalness is hard won from intensive working. Throughout the Underground Gallery you encounter similarly highly wrought pieces, some like creatures, others like bowls or giant headdresses. The marvellous Blackened Word (2008) is like a weathered cliff face, built up layer by layer over the tracing of a Polish word written on the floor. A further body of work – some prints using linen, and two hangings made from abaca paper that has been allowed to soak up the shape of a cedar sculpture – shows the versatility of her response to her primary material, the cedar. 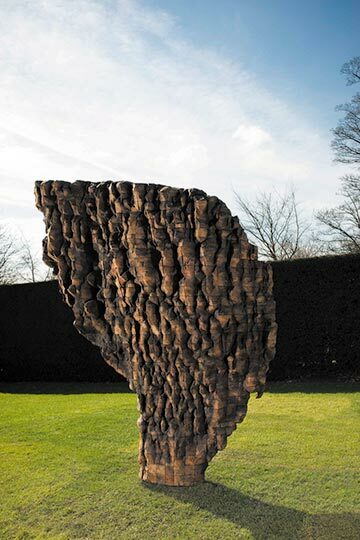 Outside, further large pieces, constructed from cedar and then cast either in resin or in bronze, continue the dialogue she has enjoyed for many years with landscape. As we stand on the hill above the Underground Gallery beside the cedar original of her Bronze Bowl with Lace, we see Yorkshire’s startling geology of folding hills and valleys with new eyes. 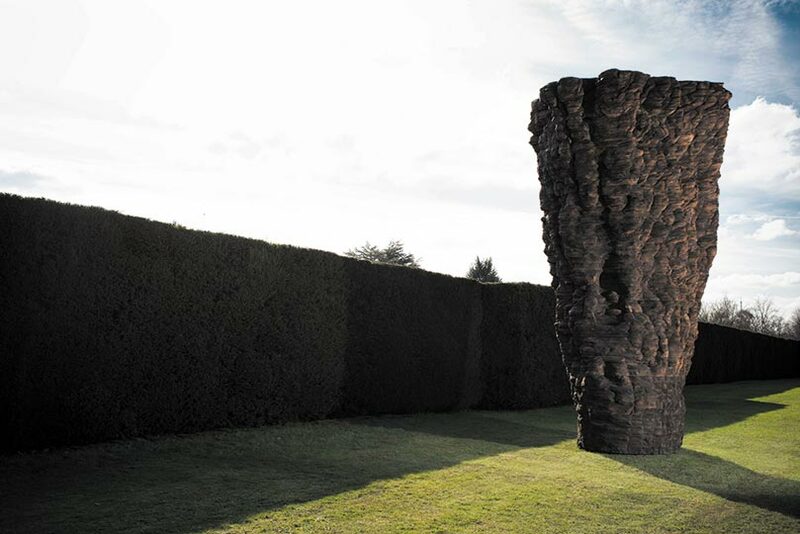 ‘Ursula von Rydingsvard’ is at the Yorkshire Sculpture Park until 4 January 2015.